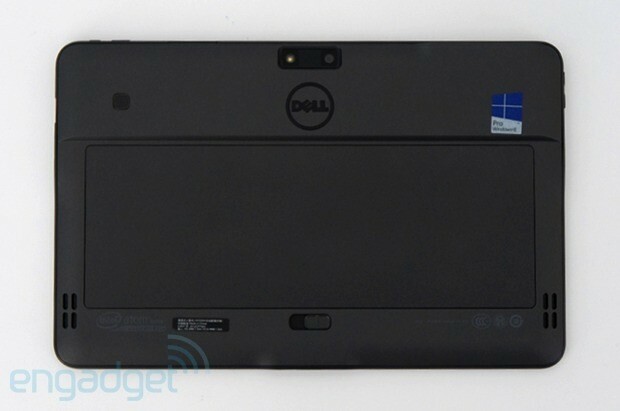 We've been making the grand tour of Windows 8 hybrids running low-powered Atom processors, and our latest stop is Dell's Latitude 10. While some similar systems, such as the ASUS VivoTab Smart and the Lenovo ThinkPad Tablet 2, focus on portable designs and long battery life, the Latitude 10 takes after that group of devices with "Smart" and "Pro" in their name. Indeed, like the Surface Pro and Samsung ATIV Smart PC Pro, the Latitude 10 flaunts a large variety of corporate-friendly features, such as TPM, a productivity dock, a Wacom-certified stylus and a Bluetooth keyboard. The entry-level configuration will set you back a tolerable $499, but adding on business essentials such as the dock and keyboard could soon have you looking at a price above the $1,000 threshold. Does the Latitude 10 work well enough to warrant the dough -- and satisfy on-the-go professionals? You know where to look if you want to find out. How would you rate the Latitude 10? "Inoffensive" is the word we'd use to describe the Latitude 10's design -- and we imagine that's exactly what many corporate customers will want. Though we have no qualms with the straightforward, black-rectangle aesthetic, we do take issue with the extremely wide bezel surrounding the 1,366 x 768 display. This cheapens the device's feel, and it makes the 10.1-inch panel seem smaller. "Inoffensive" is the word we'd use to describe the Latitude 10's design -- and we imagine that's exactly what many corporate customers will want. At 1.45 pounds and 0.4 inch thick with a 30Wh battery, this isn't anywhere near the wispiest 10.1-incher around, but it does feel plenty sturdy in the hand. This is thanks to a reinforced magnesium-alloy frame, and the coating of Gorilla Glass doesn't hurt either. The back sports a soft-touch finish that makes for a comfortable grip -- you shouldn't have to put this tablet's solid build to the test with any accidental drops. By and large, button and port placement makes perfect sense on the Latitude 10 -- and there is no shortage of connections on board. The physical Windows 8 Start button sits in its typical spot underneath the screen. Oddly, though, the button is slightly recessed rather than raised, and as a result it's a bit tricky to press. We had to apply more pressure than we're used to, and it was especially difficult to register a press when the tablet was angled upright in the bundled dock. The only other feature you'll notice on the front is the 2-megapixel, front-facing camera. Our unit offers 3G connectivity, and the micro-SIM slot is located under the removable power pack. The battery takes up a good half of the surface, and while this interrupts the otherwise clean lines, the promise of longer battery life trumps any superficial design concerns. We had to wiggle both the two- and four-cell batteries loose when switching them out, as the latch system got stuck halfway when we tried to move it. The variety of configuration options for the Latitude 10 verges on confusing. Not only are there Essential, Standard and Enhanced Security models, but there are a slew of optional accessories as well. We checked out a Latitude 10 bundled with the productivity dock, a $100 add-on. This 1.8-pound peripheral adds to an already impressive number of ports, with four USB 2.0 connections, a headphone jack and a full-size HDMI for hooking up an external monitor. There's also a power connector for charging the tablet while it's docked. It was easy to attach the Latitude 10 to the stand, but it felt rather wobbly; lifting up on the slate detached it from the base -- and that was without applying much pressure. We imagine the dock won't move far from users' desks, though, and it offers a comfortable -- though non-adjustable -- viewing angle for both watching movies and composing emails and documents. Other accessories include a Bluetooth keyboard and mouse combo (ranging from $40 to $86, depending on which of the three bundles options you choose) and a $40 soft-touch case that can act as a stand. Our review unit also came with the $40 Dell KM632 keyboard and mouse package, along with the case. Speaking of the Bluetooth keyboard and mouse, we had to force ourselves to use the device in tablet mode after enjoying this setup. You'll definitely want a set of hardware keys if you plan to do any real work, and both the chiclets and the mouse were responsive and comfortable for navigating Windows 8. That said, the Bluetooth keyboard is desktop-size, meaning the slate's 10.1-inch screen feels small in comparison. One other nitpick: the top of the mouse is removable, allowing you to insert the two AA batteries, and it comes off far too easily. We had to reattach it on several occasions during our hands-on time. Dell doesn't offer its own keyboard case; rather, it sells the Kensington KeyFolio Expert through its website. The Latitude 10's 10.1-inch screen sports a 1,366 x 768 resolution, which is par for the course when it comes to Atom-based tablets. More impressive than the pixel count is the 450-nit brightness rating; images really pop on this panel. When we watched Netflix, played a few games and surfed the web, all content appeared crisp, and colors looked accurate. Like the screens on the ASUS VivoTab Smart and the Lenovo ThinkPad Tablet 2, this display uses IPS technology, so you can expect wide viewing angles. We had no trouble making out a video from both the far left and right. Visibility would be even better if the display didn't have such a glossy finish, but that should only be an issue in settings with bright overhead lighting. An active Wacom digitizer is available for about $34, and it's only compatible with the higher-end configurations of the Latitude 10. (The lower-end Essentials version will only work with a passive stylus.) We used the pen in programs such as Windows Journal, which includes handwriting recognition, and Paint. The stylus itself feels cheaply made; it doesn't provide as good of a grip as Samsung's S Pen, for instance. Still, it works well for selecting small objects on screen, and the capacitive display offers very good palm rejection. Only once or twice did the panel detect accidental input when we were writing with the digitizer. The Latitude 10 itself doesn't have a built-in slot for storing Wacom's device, but the soft-touch case that came with our review unit sports a penholder. Audio doesn't get very loud on the Latitude 10. The two small stereo speakers are located on the back of the device, which means music and dialogue come through muffled when the tablet is on your desk (or your lap). Songs streamed via the Slacker app don't pack much punch at all, though -- as we always say with slates -- donning a pair of headphones allows for louder, slightly richer sound. As we mentioned in our review of the ASUS VivoTab Smart, lower-powered Windows tablets are pretty much uniform when it comes to specs. Like that product and literally every other competing model we've tested, the Latitude 10 runs an Intel Atom Z2760 processor clocked at 1.8GHz, with 2GB of RAM and the Intel Graphics Media Accelerator. It's no surprise, then, that Dell's slate turns in virtually identical benchmark scores to its competitors. In ATTO, the Latitude 10 notched max read and write speeds of 82 MB/s and 35 MB/s, respectively, and a cold boot takes about 15 seconds. Unsurprisingly for an Atom-powered device, the Latitude 10 wasn't able to run the 3DMark 11 graphics benchmark, which requires DirectX 11 support. That's a good indicator of what kind of gaming performance to expect -- you'll be fine playing Angry Birds, Solitaire and the like, but serious titles are out of the question. We experienced a few glitches, such as app crashes and force quits throughout our hands-on time with the Latitude 10, but these moments were few and far between. Switching between apps didn't cause the system to stutter, and we never found ourselves tapping our fingers waiting for programs to load. When we ran our battery test, which involves running a locally stored video on loop with WiFi on and brightness set to 65 percent, the Latitude's 30Wh battery lasted nine hours and three minutes. That compares favorably to other Atom-powered machines, such as the Acer Iconia W510 (eight hours and 19 minutes) and the HP Envy x2 (seven hours and 53 minutes). While that's fairly average for an Atom-powered Windows 8 tablet, it trumps them all when you add in the optional 60Wh power pack: with that attached, we got a jaw-dropping 16 hours of runtime. The Latitude 10 sports a 2-megapixel, 720p, front-facing camera for video chats along with an 8MP rear shooter with flash. When we took a few selfies in our brightly lit office, our images appeared grainy with a strong yellowish overcast. This is sadly the status quo for most tablet webcams, but moving to an area with natural light should help if you have to take a Skype meeting in a pinch. Our samples from the 8MP rear camera show fairly accurate colors and for the most part look quite sharp. Some pictures taken in shadowy settings look darker than they should, and images taken with flash unsurprisingly look very washed out. Camera options are fairly limited: there are controls for brightness and contrast, along with a toggle for auto or manual exposure. Sample video footage of Union Square in New York looked crisp and didn't exhibit much jerkiness. In short: if you insist on bringing a tablet along to document your adventures, the Latitude 10's cameras will certainly suffice. Dell bolsters the Latitude 10's cred as a business device with several security-minded features, including TPM and support for Computrace. Keep in mind that this software isn't available on the Essentials version of the device. The company also offers data encryption for protecting files. We've seen more offensive pre-loads than the software selection on the Latitude 10. Out of the box, the tablet includes Dell Backup and Recover, a trial of Microsoft Office and Skype. You'll also find the standard Windows 8 apps, such as Bing, Maps and Weather. Our 3G-equipped configuration of the Latitude 10 also comes with the AT&T AllAccess utility for managing your data plan. Dell offers a standard one-year limited hardware warranty. There are several available configurations of the Latitude 10, all with the same 1.8GHz Intel Z2760 processor and 2GB of RAM. On the lower end is the $499 so-called Essentials configuration, which runs Windows 8 and offers a 32GB SSD. For $80 more ($579 total), you can step up to a 64GB Essentials model. Next up the rung is the $649 Latitude 10, which gets you Windows 8 Pro, a 64GB SSD, a swappable battery, active stylus support and security features such as TPM. A $779, 64GB model includes those same features and adds a smart card reader and fingerprint reader, and it also supports mobile broadband. 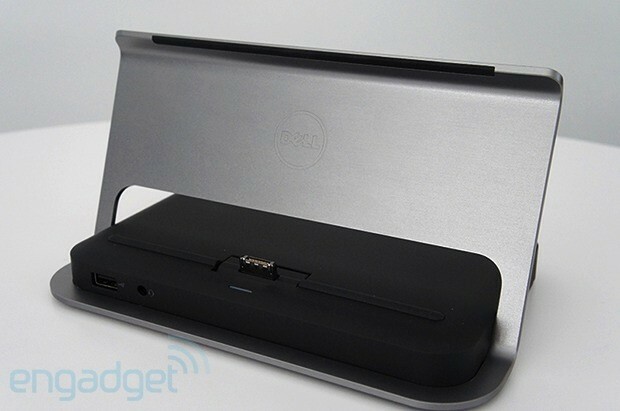 You could also spring for Dell's $849 Mobility bundle, which includes the productivity dock and 3G connectivity. Some of the most useful features don't feel tailor-made for a portable lifestyle, and how useful are peripherals if they can't travel anywhere with you? We took a look at two configurations of the Latitude 10. 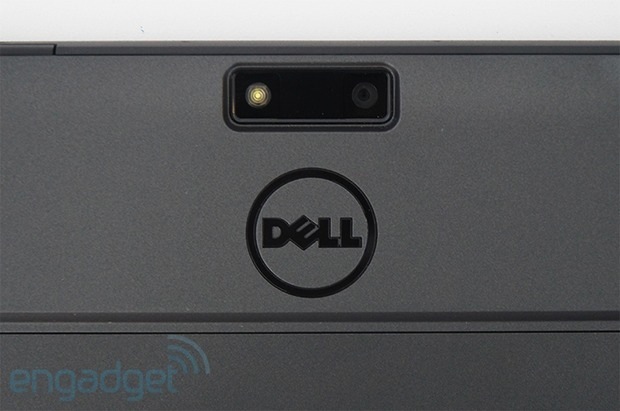 First up was the Mobility bundle, which Dell supplemented with several add-ons. With the four-cell swappable battery, Bluetooth keyboard and mouse, soft-touch case and Wacom digitizer, that option comes out to $1,019. (Note that Dell often runs promotions, so you may see slightly different prices.) 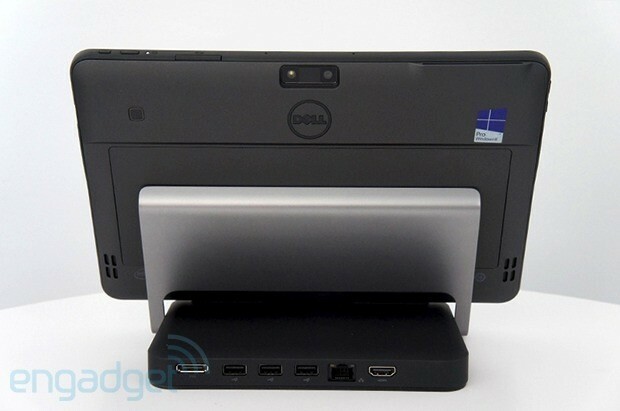 Due to a faulty battery, though, Dell sent us another model to test: the Enhanced Security version with a fingerprint reader, smart card reader, swappable four-cell battery and the productivity dock. That configuration -- without peripherals such as the Bluetooth keyboard and mouse -- costs about $934. If you're going to go for the Latitude 10, we'd recommend shelling out for the full trappings, since you'll need a keyboard -- and likely an external monitor -- to get real work done. That said, those extras bring the price into Ultrabook territory, and you won't be getting Core i5-level performance with Dell's hybrid machine. As always, we recommend surveying the field before committing to a product, and you have quite a few other options if the Latitude 10 piques your interest. When it comes to a good value, it's hard to beat the ASUS VivoTab Smart, which gets you 64GB of storage for $499. We like the 1.28-pound tablet's design -- with a polycarbonate back shell -- and relatively high-performing camera, but battery life isn't best in class, and there's no pen support. Acer's $550 Iconia W510 is another relatively inexpensive offering, and it has good battery performance and an IPS display in its favor. The downside is a cramped and unattractive keyboard dock -- and that brings the price up to $750. If you want to wield a stylus, check out the Lenovo ThinkPad Tablet 2. This may just be our favorite low-powered Windows 8 hybrid, thanks to a comfortable keyboard and impressive longevity. Pen input does come at a slight premium, though: it's $649 for a 64GB, stylus-equipped model. Lenovo also has the more consumer-friendly IdeaTab Lynx (review coming soon). There's also the Samsung ATIV Smart PC Pro, which runs a full-fledged Core i5 CPU and includes an S Pen, but that will set you back $1,200. There are plenty of things to like about the Dell Latitude 10, in no small part due to the vast number of optional accessories that boost the device's productivity chops. Even without the swappable four-cell battery, this machine offers good longevity, and its bright IPS display stands out among other panels in its class. That's not to say this product is without its flaws, though; some of the most useful features, such as the productivity dock and the optional keyboard, don't feel tailor-made for a portable lifestyle, and how useful are peripherals if they can't travel anywhere with you? The price is also pretty steep when you factor in all the extras that make this system so corporate-friendly. If your pockets can handle it, splashing out for the highest-end configuration with all the bells and whistles will net you a solid product. 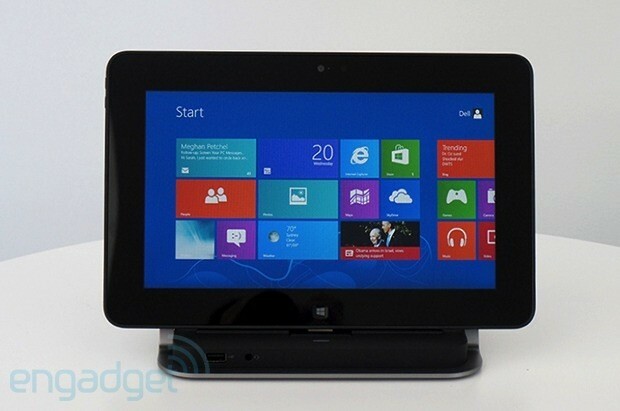 Those who need to stay south of $1,000, though, should consider the ThinkPad Tablet 2 and ASUS VivoTab Smart instead. Update: The Dell Latitude 10 runs Intel's Graphics Media Accelerator, not Intel HD Graphics 4000.